We explore 13 ingredients, from fruits and vegetables to seafood and even bacon, and help show you how to pair wines with whatever you're cooking at home. Recommending a specific wine to pair with a specific dish or recipe is one thing. But what about when you’re cooking at home? How do you decide what wine to pair depending on the ingredients you’re cooking with in your own kitchen? A bracing bit of freshness in cooler months, the cranberry has much to offer beyond a cloying blob on the Thanksgiving table. This hard, sour fruit cooks well and lends complexity to desserts like crisps, galettes, sorbets, scones and upside-down cake. It also adds zest to meat dishes, especially pork, duck and, of course, turkey when made into relish, chutney, salsa or the traditional cranberry sauce. They can also be used in place of sour cherries, grapes and other berries in recipes, and their unsweetened juice can be substituted for vinegar, lemon juice or lime juice. Pair these powerhouse berries with a wine that shares their bright acidity, tart red fruit and even a bitter or floral edge: Think Sangiovese, Nebbiolo, Barbera, Beaujolais and red Burgundy. Rosé Champagnes and sparkling reds can also be terrific. • This year marks the 200th anniversary of the first recorded farmed cranberry crop, in Dennis, Massachusetts. The state is the second-largest producer in the U.S., after Wisconsin. • Whole, raw berries can be frozen and used interchangeably with fresh ones. If you’re cooking with frozen cranberries, you don’t need to thaw them first. • Americans consume more than 400 million pounds of cranberries per year (about 90 percent of the crop goes to juices and canned sauces). Approximately 80 million pounds are enjoyed during Thanksgiving week. • The fruits contain small pockets of air that make them bounce and float. • Native Americans had several names for cranberries: sassamanash, ibimi and atoqua. They used them for medicine, dye and (when mixed with dried meat) a food called pemmican. • European settlers named them “craneberries,” for their flowers’ resemblance to the bird. Click through for two exclusive Wine Enthusiast cranberry recipes—Apple-Cranberry Crisp and Pork Chops with Cranberry Reduction—and expert wine pairings for the season. • The word “strawberry” is believed to derive from “stray” or “strew,” for the fruit’s tendency to propagate promiscuously. • Strawberries are the fifth most consumed fresh fruit in the U.S., after bananas, apples, oranges and grapes. • Like raspberries and blackberries, strawberries are in the same subfamily as roses. None are true berries. • The Guinness World Record for heaviest strawberry is 8.82 ounces. It was the size of an apple. Apples, the country’s second-most-consumed fruit after bananas, hold a special place in our culture. They’re a symbol of Americana, everywhere from apple pie to the Big Apple. In the kitchen, there’s no end to their versatility. They show equal affinity with sweet, sour, spicy and meaty flavors, while apple cider and brandies (like applejack and Calvados) show the fruit’s appeal in the glass. Apples may not keep the doctor away, but they can’t hurt. • Le trou Normand (“the Normand hole”) is a French tradition where diners take a sip of Calvados during a long meal to restore appetite. • The heaviest apple ever picked weighed more than four pounds. • As Chinese as apple pie? China produces almost 10 times more apples than the U.S..
• Apples originated in Kazakhstan. The only variety native to North America is the crabapple. • Steve Jobs took his inspiration from a visit to an orchard when he named Apple. Don’t associate the fruit with the muddy, bitter taste of packaged grapefruit juice. If you cut away its bitter white pith, fresh grapefruit strikes the perfect balance between tangy lemon and honeyed orange. It’s a natural in cocktails (especially with gin, Tequila or Campari), but always use fresh-squeezed juice. Some of its culinary affinities include fish and shellfish, goat cheese, Brussels sprouts, almond, avocado, rosemary and honey. Try a grapefruit beurre blanc with fish, or a salsa of minced grapefruit, red onion, avocado, jalapeño and cilantro with grilled chicken or tacos. However, “Sauvignon Blanc is usually the best choice with grapefruit, due to its natural grapefruit aromas and flavors,” says Juan Gomez, MS, wine director of The Breakers Resort in Palm Beach, Florida. “In particular, Sauvignon Blancs from Marlborough, New Zealand, are the most expressive, exhibiting a sweet grapefruit quality as well as pungent herbal notes that complement grapefruit-based dishes.” Click through to the next page for recipes and pairings for a four-layer grapefruit cake and grapefruit, avocado and crab salad. • In Southern France, grapefruit juice is mixed with dry rosé to make a summer refresher. • For a delicious grapefruit cocktail, mix up a Paloma: equal parts blanco Tequila, grapefruit juice, lime juice, simple syrup and club soda. • The tangelo is a cross between the grapefruit and tangerine. • The Latin name for grapefruit is, appropriately, Citrus x paradisi. • The U.S. is the world’s No. 2 grapefruit grower. No. 1? China, which produces almost four times the U.S. output. • In 1964, Yoko Ono published a book titled Grapefruit (Wunternaum Press), which consists of drawings and “instructions” for the reader to create their own performance art (“step in all the puddles in the city”). • Europeans consume almost 10 times more hazelnuts than Americans do. • Approximately 75 percent of the world’s hazelnuts are grown in Turkey, followed by Italy and the U.S., where the vast majority comes from Oregon. • The Greek physician Dioscorides used burnt hazelnut shells mashed with suet as a cure for baldness. • Established in 1892, the Dorris Ranch Living History Filbert Farm in Springfield, Oregon, is the nation’s oldest commercial hazelnut farm in continuous operation. “Hazelnuts are a very wine-friendly nut,” says Higgins. “They have a rich creamy flavor, but aren’t too tannic like walnuts, or too oily and pungent like pine nuts.” For recipes involving cheese or cream, Higgins recommends a lightly oaked white wine. Something vegetal, like a hazelnut pesto, pairs well with a fruity Pinot Noir. For an inspired pairing with any hazelnut dish, look to Fiano di Avellino DOCG, a white wine from Campania in southern Italy. It has a distinct toasted hazelnut quality, perhaps thanks to the hazelnut trees that grow alongside the vineyards. As common as the carrot is, it’s also underappreciated. You know that they’re delicious raw, roasted, pickled and puréed into a soup, but don’t stop there. Carrots are also at home in croquettes, salsa, gnocchi, savory soufflés and even ice cream. Younger carrots are generally sweeter and more flavorful. When you can, buy smaller carrots with the tops attached. Young tops taste like a cross between parsley and carrot; they can be used in pesto and other herb sauces. • Pennsylvania’s Boardroom Spirits has a 92-proof spirit made from carrots called C.
• Bagged “baby carrots” are suspiciously uniform for a reason: They’re blemished carrots cut into that shape. • The orange carrot is a 17th-century Dutch hybrid of red and yellow carrots. • The longest carrot ever grown was more than 20 feet long, and the heaviest was nearly 20 pounds. Celery is often an unglamorous workhorse in crudité platters, vegetable soups and green juices, but it can take on a starring role, if only given the chance. Classics like celery gratin and Waldorf salad are back in fashion, and dishes like the Celery Victor (a chilled marinated-celery salad) at San Francisco’s Cockscomb have gained cult status. • Ancient Romans used celery as an aphrodisiac. • The Guinness World Record for the heaviest head of celery is 75 pounds. • Celery Victor was invented at San Francisco’s St. Francis Hotel in 1910. • Celery leaves were included in garlands found in King Tut’s tomb. • Hippocrates described celery as a nerve soother, and in its 1897 catalog, Sears Roebuck Co. featured a celery nerve tonic. Nothing screams “August farmers’ market” like the spicy-sweet scent of fresh basil. The name comes from the Greek basilikón, meaning “royal,” and, indeed, it’s often referred to as the royal herb or king of herbs. Basil is a member of the mint family and a good replacement in juleps and smashes. And stop arguing: Both BAYZ-uhl and BAZ-uhl are accepted pronunciations. • Basil is considered an aphrodisiac in Romania; in Mexico it’s believed to attract money. • The French phrase semer le basilic (“to sow basil”) means to slander or rant. • Basilcello is a bright green, basil-infused liqueur found in some Italian homes. • In the U.S., the name Basil—currently on a sharp upswing—reached its peak in 1911. • In Hinduism, Tulsi, or “Holy Basil,” is a sacred plant associated with the god Vishnu. • The tallest basil plant ever recorded was 11 feet tall and grown in Crete. “Basil is truly one of the world’s most flexible herbs,” says Bruce Achtermann, head of the beverage program at The Herbfarm in Woodinville, Washington. The restaurant’s tasting menus often focus on herbs from its gardens, which include more than a dozen basil varieties. “Some basils are more citrus driven, others are more spicy in focus. If basil is your primary driver, look to play off of the sharp green aromatics with a Sauvignon Blanc from New Zealand or Chile’s Casablanca Valley. If it’s used more as a spice, your options are endless.” Achtermann recommends Champagne or a domestic blanc de blancs with spicy Thai basil–driven dishes. He suggests a buttery Chardonnay with sweet Genovese basil and pasta, while a rich, savory Bordeaux blend or Cabernet Franc pairs well with steak crusted in several types of basil. For dessert, he suggests tearing fresh cinnamon basil over ice cream and serving Vin Santo. • In the U.S., they grow wild in California, Texas, Florida, Arizona, Hawaii, Louisiana and Nevada. • Estée Lauder’s “Pleasures” was the first perfume to use pink peppercorns in its formula. • The soft husks of pink peppercorns will clog a pepper grinder—instead, crush them with the back of a wooden spoon. • Pink peppercorns have an aromatic quality that’s similar to but milder than juniper, making them a tasty addition to gin cocktails. Considered sacred since before Biblical times, the olive tree remains treasured. The unique flavor of its fruit is surprisingly versatile. It pairs amicably with sweet flavors (oranges, dates, tomatoes, caramelized onions, fennel), salty foods (capers, feta cheese, anchovies, cured meats), and all kinds of nuts, dairy and fresh herbs. It can provide a punchy blast of contrasting flavor, or be the centerpiece of dishes like tapenade, muffuletta or puttanesca. Green and black olives are the same fruit. Except for a few outliers, a green olive is simply an unripe black olive. All are bitter and inedible when picked, so they’re cured and fermented using brine, salt and/or lye. Like with wine, when you eat an olive, you’re tasting both the fruit and how it was handled. • The average olive tree’s lifespan is between 300 and 600 years. Today, some fruit-producing olive trees are more than 2,000 years old and still going strong. • Olives, like wine grapes, thrive in a wide range of soil conditions, which accounts in part for their complexity. • An olive branch appears on the flags of five U.S. states, several countries and the United Nations, where it symbolizes peace. • Jasmine and lilac are in same biological family as olives, Oleaceae. • Spain produces nearly half of the world’s olive oil. Italy is the next largest producer. Many wines that exhibit olive notes, like Sagrantino, Syrah from Côte-Rôtie and some Cabernet Franc and Cabernet Sauvignon, are best reserved for rich, cooked dishes like pastas and braises, says Campanale. Live scallops should be eaten the day they’re purchased. When buying shucked scallops, ask for “dry” scallops. 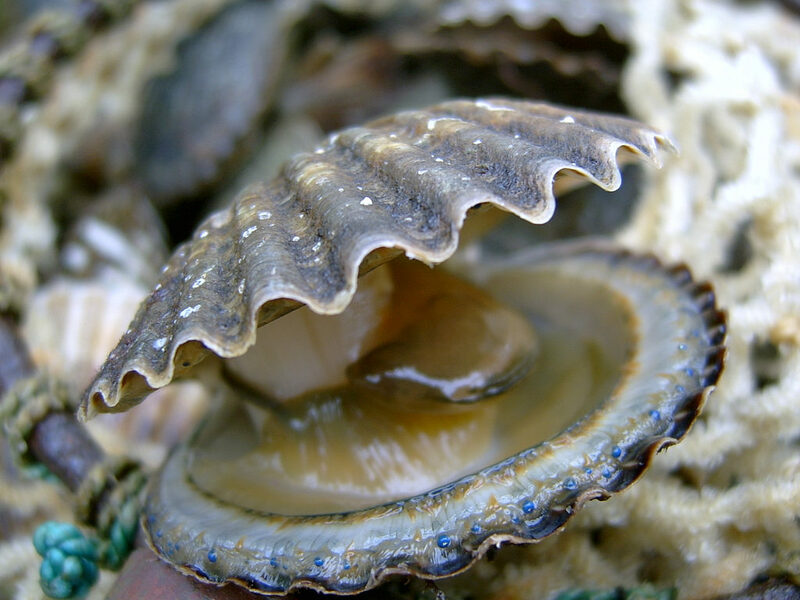 “Wet” scallops have been soaked in a phosphate solution to preserve and whiten them, but it also dilutes flavor and detracts from the dense, meaty texture. • Scallops have tiny eyes—sometimes more than 100— that line their shell edge. • The scallop is the symbol of the Camino de Santiago, the pilgrimage to the shrine of St. James in Spain. • Scallops can produce pearls, but they lack the luster of those from oysters. • A scallop shell is featured in the coat of arms of Winston Churchill and the Spencer family of Princess Diana. • Because they are active swimmers, scallops are the only migratory bivalves. Most Americans know sardines in love-them-or-hate-them canned form, but coastal cultures around the world, from Italy, Spain and Portugal to India and Japan, eat them fresh. That way, this small fish—actually comprising several species in the Clupeidae family—is firmer and less fishy than the canned version, comparable to mackerel. If you find fresh sardines, have your fishmonger clean, gut and scale them. Then, season and char them on a hot grill for two minutes per side. They’re difficult to overcook, so they’re perfect for the grill. • The Guinness world record for “most seafood prepared at an outdoor event” was 14,000 pounds of sardines at a 2010 festival in Setúbal, Portugal. • The Smithsonian’s National Museum of Natural History has a 14-karat gold sardine can in its collection, enhanced with 55 Russian diamonds, by gemstone artist Sidney Mobell. • In 1989, in Ipswich, Australia, about 800 sardines fell from the sky onto a couple’s lawn during a light rain. • The expression “packed like sardines” was first recorded in 1911 in the letters of English poet Wilfred Owen. To cut through the rich fish, try high-acid coastal white wines like Albariño from Rías Baixas, Muscadet, Vermentino from Southern Italy’s coast, Santorini Assyrtiko and Vinho Verde (the Portuguese are likely to drink equally crisp red Vinho Verde). It’s cliché to say everything’s better with bacon, but it’s true. Bacon lands a direct hit on the brain’s comfort center. The mania of a few years ago has reached a more reasonable stride—we’re seeing fewer desserts focused on the cured meat, and bacon cologne, thankfully, never caught on. Now’s a good time to rediscover its versatility and, yes, sophistication. Bacon can refer to cured pork from the belly, back or side. American bacon is cured pork belly that’s cold smoked and cooked before eating. While bacon-dominant dishes like BLTs and wedge salads are fantastic, treat it more as a supporting actor than the star. • Kevin Bacon, indeed, loves bacon. His favorite sandwich is the BLAST: bacon, lettuce, avocado, smoked salmon and tomato. • The first bacon cheeseburger from a national chain was A&W’s Teen Burger, in 1963. • During World War II, households were asked to donate bacon grease. Its glycerin was used in explosives. • Molly Schuyler, at 5-foot-7, 125 pounds, set a Guinness world record when she ate five pounds of bacon in 5 minutes, 21 seconds. • The formula for bacon cologne was created in 1920 by a Parisian butcher named John Fargginay.